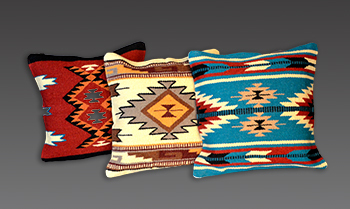 Quality hand woven imported wool pillow covers. Dry clean recomended. Super durable for a lifetime of use. Pillow covers are $19.95 each. Please click on photo for a larger image and Ordering. Note! We will be fazing out the old style pillow covers. Once supplies are gone, we will no longer be able to get them. Old style covers are on the tile background. New style covers are below on the grey background. 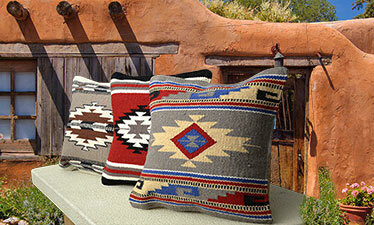 CLICK PHOTO for "NEW DESIGNS"
easy to insert 18" x 18" pillows! Please Click Image for Larger Picture!